There was a bit of a vogue a couple of years ago among some of my acquaintances for bagging artefacts of ‘totalitarain kitsch’ as souvenirs of travels and business trips in Africa and Asia. Gaddafi watches and rugs, Pakistan army mugs and stickers and scary gilt-framed photos of (now deposed) Tunisian dictator Ben Ali were just a few of the items that were brought back home, to be met with a delicious mixture of horror and hilarity by friends and colleagues. This all suddenly seems in somewhat poor taste given recent events in North Africa. Ben Ali and Mubarak have gone, and Gaddafi is still clinging on to power as Libya burns. Perhaps it will only be after the dust settles on the crisis that the outside world will be able to get anything like real insight on what life has been like for Libyans under the repressive and secretive Gaddafi regime. Sam Leith did a great piece in The Evening Standard earlier in the week analysing the way in which the Western media has turned the undeniably bonkers Libyan despot Gaddafi into a figure of fun (for an example of this tendency, see this slide show in Vanity Fair on Gaddafi’s fashion sense). 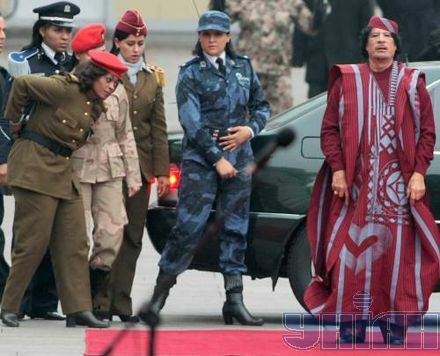 By having a good old laugh at Gaddafi’s hilarious outfits and hot female bodyguards, Leith argues, we have turned him into a bogeyman – and this has rather masked extent of his brutality. Tony Blair‘s government started flogging him arms and buying oil from him; and the general conversation rehabilitated Gaddafi as a comic character. He wasn’t the first it has happened to. Think of Turkmenbashi, with his rotating golden statues and his bonkers poetry; or of stack-heeled, bouffy-haired Kim Jong-Il, singing “I’m so rone-ery!” in Team America: World Police. Peter York did a book called Dictator’s Homes a couple of years ago: a Hello!-style album of funny photographs of the kitsch ways in which despots did up their front rooms. My dear, the vulgarity! It seemed to epitomise the way sophisticates end up occluding what they know about very bad men by making a joke out of them. Of course, to make bogeymen look absurd is the proper task of ridicule. But by making them cartoony, we also risk making cartoons of the people who suffer under them. We risk forgetting why they are bogeymen. From the student with his bust of Lenin and his Che Guevara T-shirt to the hipster wearing the Chairman Mao wristwatch, the ironic appreciation of foreign mass-murderers is a sort of connoisseurship. 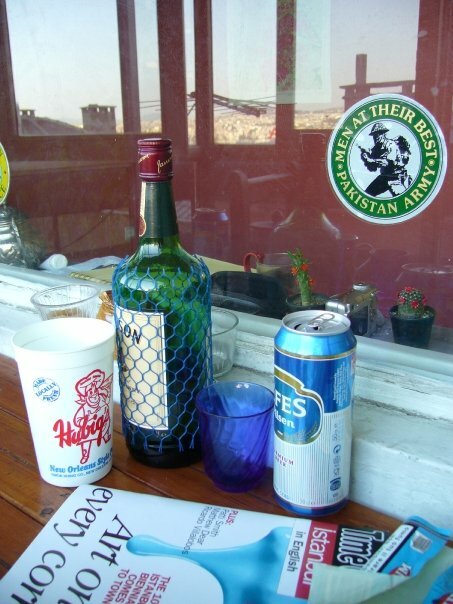 Does collecting bits of ‘totalitarian kitsch’ from travels also have the same effect? I think very possibly it does. I’m not going to be a hypocrite here because I think that this is a form of humour I wholeheartedly participated in at one point in my life. It’s just that it doesn’t seem quite so funny now. There is a really amusing (and often painfully true-to-life) website called ‘Stuff Expat Aidworkers Like’. It includes such gems as #15 dressing like a local and #9 war junk (expat aidworkers just love to pose next to burned-out tanks!). I think I would also include ‘collecting Totalitarian Kitsch’ as something that expat aid workers like; also journalists, political analysts, business execs and students. Pakistan army window stickers: whose poor taste? This entry was posted on February 26, 2011 at 8:43 pm and is filed under Uncategorized. You can follow any responses to this entry through the RSS 2.0 feed. You can leave a response, or trackback from your own site. as someone who is 100% guilty of this (i had a ucpn-m political poster as my computer desktop background three years before i even thought i would ever go to nepal), good food for thought. thanks for the post.